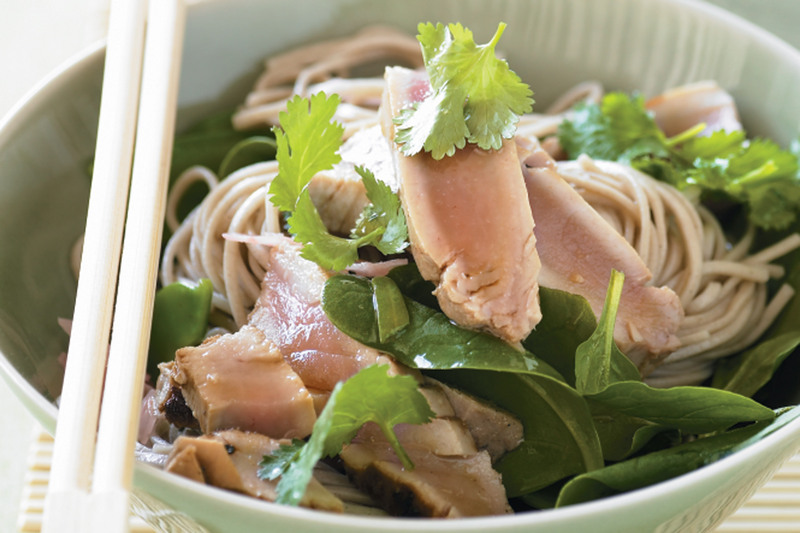 This delicious Asian-style noodle salad is low in fat but high in omega 3s. Place tuna in bowl. Combine the fresh ginger and half the mirin, lime juice and soy sauce in a bowl. Pour over tuna. Place in the fridge for 20 minutes to marinate. Cook the noodles following packet directions, adding the snow peas in the last 2 minutes of cooking. Drain. Place in a bowl. Add half the oil and toss to coat. Combine sugar, remaining mirin, lime juice, soy sauce and oil in a screw-top jar. Spray a non-stick frying pan with olive oil spray. Place over high heat. Cook tuna for 1-2 minutes each side for medium or until cooked to your liking. Thinly slice. Stir the pickled ginger, spinach and half the dressing into the noodle mixture. Divide among serving bowls. Top with tuna and coriander. Drizzle over the remaining dressing to serve. Note: If mirin is unavailable, use sake or dry sherry instead.